The former Maryland College of Art & Design, soon to be Montgomery County's new park. After years of fighting between residents, a developer, and Montgomery College, Montgomery County's parks department will will turn an abandoned art school in Wheaton into a park. While it's a triumph for neighbors hungry for more park space, it also shows how indifferent the county to its own goals for walkable communities, providing more housing, and land preservation. Montgomery Parks recently acquired the former Maryland College of Art and Design at Georgia Avenue and Evans Drive in Carroll Knolls, a community of modest post-war homes less than a mile from the Wheaton and Forest Glen Metro stations. They bought the 2.47-acre property for $1.14 million, well below its original asking price of $2 million, with plans to demolish the building and add 1.2 acres the county already owns to form the future Carroll Knolls Local Park, a construction date for which hasn't been set. Neighbors acknowledge that the area already has a number of parks, but argue that they're either too far or require crossing busy Georgia Avenue. "We are relieved that we will not have to cross Georgia Avenue, a six-lane state highway, without a pedestrian bridge, a crosswalk, nor an intersection light to access nearby parkland," said Beverly Sobel, head of community group Green Space on Georgia, in a press release from Montgomery Parks. Residents say Georgia Avenue is too dangerous to cross on foot. The new park is across Georgia Avenue from Evans Parkway Park, a four-block-long green space that's currently being renovated and expanded, but to some that's not enough. It's "not realistic for parents to ask their kids to cross Georgia Avenue to go to a park," said County Councilmember Marc Elrich at a community meeting in 2009. Montgomery Parks staff agreed, calling Georgia Avenue a "de facto river of traffic that blocks pedestrian access" in their recommendations to turn the MCAD site into a park. They drew a map of the area with 1/4-mile circles around each park to show what was within a short walk, but cut them off at Georgia Avenue, rendering Carroll Knolls parkless. Montgomery Parks map showing areas within walking distance to parks. MCAD site is outlined in red. However, one could argue that this conclusion was premature. There are already stoplights and crosswalks a block north and two blocks south of Evans Parkway Park. Making those crossings safer, expanding the sidewalks on Georgia Avenue, and building new sidewalks on the side streets could have provided a nicer and safer not only to the park, but to other amenities in the area. So why didn't neighbors push for those improvements instead? Green Space on Georgia's homepage makes it clear: "Our current efforts are in opposition to the proposed development of townhouses on the current site of The School of Art + Design at Montgomery College." 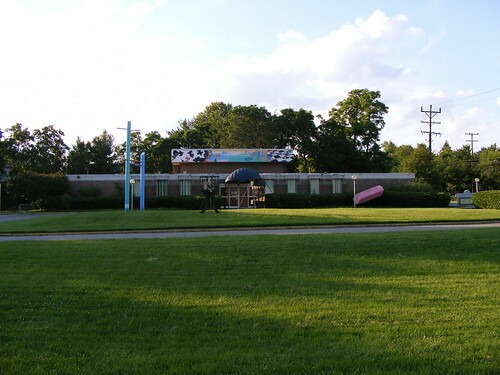 After absorbing MCAD in 2005, Montgomery College gave the property to the Montgomery College Foundation, which raises money for the school. In 2007, they had a contract to sell it to developer Kaz Brothers, who successfully petitioned the County Council to rezone the property to allow townhouses. Existing townhouses near the future Carroll Knolls Local Park. Residents balked, arguing that townhouses violated Carroll Knolls' 1948 covenants, which allowed only single-family homes in the neighborhood. They formed Green Space on Georgia and applied to have the property become a park through Legacy Open Space, a county program that preserves places with historic, cultural and natural significance. The Planning Board rejected it, saying that the cost would be too high. Kaz Development sued the neighbors, arguing that the now-derelict school already invalidated the covenant; though the Montgomery County Circuit Court ruled in their favor, the neighbors appealed and the decision was reversed in the Maryland Court of Appeals. 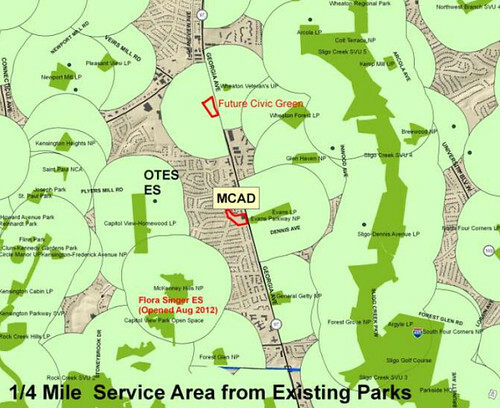 A second application to Legacy Open Space was approved last year. The creation of Carroll Knolls Park is a triumph of grassroots campaigning, but it contradicts many of Montgomery County's stated goals and policies. The county wants to promote walking in and around downtown Wheaton but missed an opportunity make it easier to cross its main street. County Executive Ike Leggett talks about facing "unprecedented budget challenges," but nixed an opportunity for needed tax revenue. Montgomery Parks' strategic vision for the county's park system calls for prioritizing existing facilities, but spent millions of dollars to build a new park across from a park they're already expanding. The county placed a third of its land in an Agricultural Reserve, but creates more pressure to develop it by not building in the rest of the county. And Carroll Knolls isn't the only neighborhood doing this. White Oak residents opposed to an affordable housing development asked the county to create a nature preserve instead. In South Silver Spring, neighbors who don't want their views blocked by a proposed apartment building are calling for a park as well. And residents in East Silver Spring are preemptively fighting the redevelopment of the old police station, saying it should become a community garden and arts center. That's not to say that parks aren't necessary, or that the best solution for every vacant lot is private development. But Montgomery County is faced with a significant housing shortage, with a need for as many as 108,000 new homes in the next 20 years. We simply can't afford to turn every unwanted development site, especially those in close-in communities, into a park. Please check out our comment policy and policy on anonymous commenters. 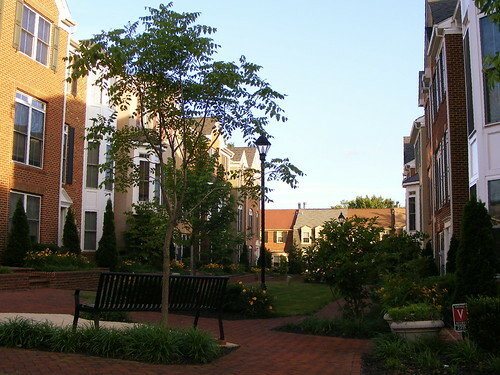 Most of the people who oppose these types of developments in montgomery county are part of a small but vocal minority which usally do not represent the demographics of the neighboorhood in which they claim to represent. I live on Plyers Mill Road east of Georgia Avenue, so I know the area in question pretty well. I appreciate your point about the need for more infill residential development, but I think you are underestimating the danger of crossing that section of Georgia Avenue, even with a traffic light. We frequently cross Georgia at Plyers Mill (with the light) and it is really hairy dodging the turning cars. I would love to see some engineering to make Georgia safer for pedestrians, but I don't think it's realistic to call Evans Parkway Park "walkable" from the west side of Georgia, even if it is right across the street. I live next to Columbia Pike, which in my neighborhood is a six-lane divided highway with a posted speed limit of 50 miles an hour. Yet I and many other people in East County regularly cross the Pike - at stoplights - to reach buses, shopping, or other things. 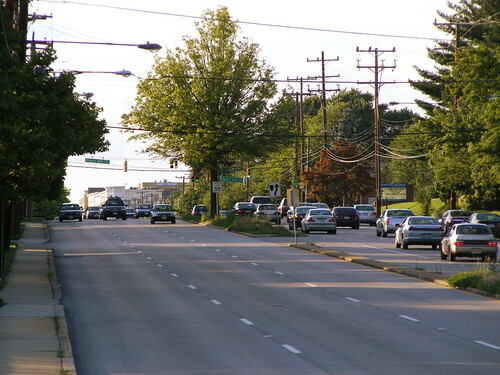 There are lots of streets like it in Montgomery County, including Georgia Avenue further north in Aspen Hill or Olney. Compared to those streets, Georgia Avenue near the MCAD site is much better. I don't blame residents for feeling as they do, but if Montgomery County assumes that a street like this is hopelessly impassable, then what happens on all of the bigger, faster streets where people want to walk to the other side? Also, I agree with Dan - if Georgia Avenue is not passable by pedestrians than THAT is the problem that MoCo Needs to solve. This is absurd.